Anything under the sun: Talk Facebook and Twitter with Dragon 11.5 Premium - SAVE! Talk Facebook and Twitter with Dragon 11.5 Premium - SAVE! NEW Dragon Remote Mic app that turns your iPhone into a wireless microphone for use with Dragon on your PC. The Dragon Remote Mic app is available FREE of charge from iTunes. NEW Social media commands that make it faster and easier to post to Facebook and Twitter. Just say “post to Facebook” and simply speak your status update. NEW Formatting and editing commands (such as “quote that” and “bracket that” or “undo all” for multiple match formatting) will help version 11.5 customers get more done faster on their computers. Version 11.5 also adds support for the latest new applications and operating systems, and it incorporates user interface and usability enhancements to user profile creation, the Dragon Sidebar, the correction process, and more! Stop struggling with a keyboard and mouse. Simply speak words and they appear on your computer screen — three times faster than typing — with up to 99% accuracy right out of the box. 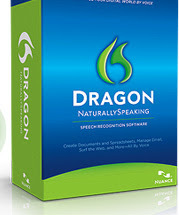 Dragon keeps up with your brain, capturing your thoughts and ideas as fast as you can speak them. Use Dragon to talk your way through your “to-do” list -- email, reports, spreadsheets, presentations, social networking, and more - quickly and confidently. With Dragon Premium, you can even be productive on the go. Use your iPhone or iPod as a wireless microphone at your PC, or dictate to a digital voice recorder and Dragon will transcribe the audio files when you return to your PC. Dragon 11.5 Premium is remarkably easy to install and use, which means you'll start realizing productivity gains immediately. An intuitive new interface makes it easier than ever to discover and access powerful, time–saving features, commands and options. So even novice users can take full advantage of all that Dragon has to offer — right away. The everyday price of Dragon 11.5 Premium is $199.99. But through this exclusive introductory offer, you can purchase for just $159.99 and SAVE $40!